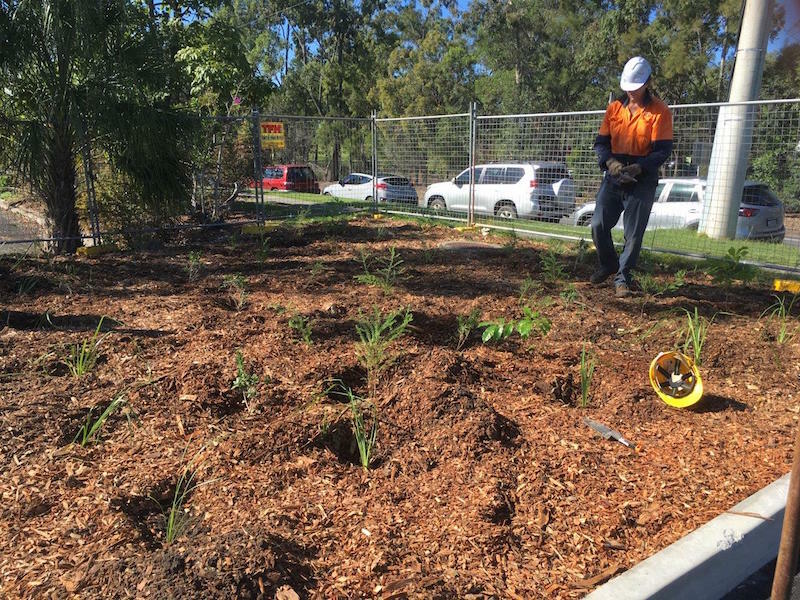 B4C Landcare Services, commissioned by Moggill Constructions, has undertaken landscaping of the newly constructed carpark and the revegetation of the remaining greenspace adjacent to neighbouring properties, at the Logan Hospital and TAFE Queensland site. Site preparation and weed treatment removal of areas post vegetation clearing. The installation of native plants, for landscaping, revegetation for native vegetation clearing, and stormwater management. Three month maintenance period to ensure the landscaped and revegetated areas in a well maintained condition, prior to hand over to client. 3,650 native ground covers, shrubs and trees planted over 2,300 m2. Native landscaped garden beds within carparks to provide visual amenity and shade for users. Compensatory revegetation for loss of threatened species and native vegetation clearing including offset planting of Swamp Tea Trees (Melaleuca irbyana). Weed removal and infill planting of native shrubs and trees within remnant native vegetation on property boundary. 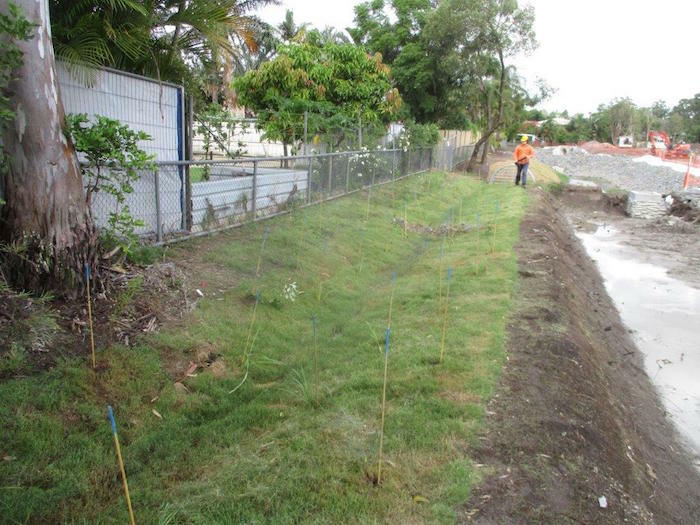 Planting of native wetland grasses and shrubs in bio-retention basin for the treatment of runoff from the carparks, and detention basins for the controlled discharge of stormwater into local creeks. B4C Catchment Manager Wayne Cameron says that, while working within time constraints and embracing practical issues, B4C has been able to partner with this larger company who want to make full use of our specialised ecological services. “The works, particularly in constructing high quality bioretention basins at Logan Hospital, are testament to this great partnership,” Wayne said. 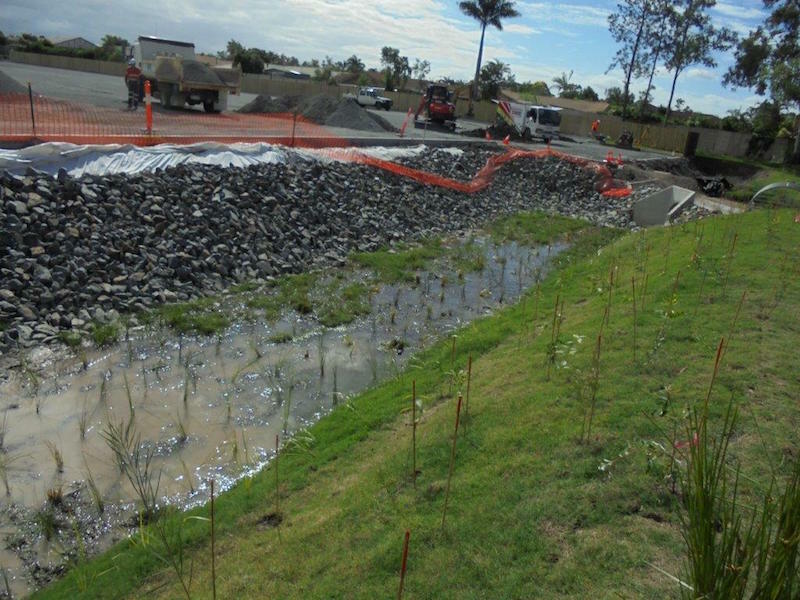 Bioretention basin, Logan Hospital, stormwater, weed removal.